Washington (CNN) - Republican Rep. Paul Ryan of Wisconsin said Sunday he will decide this week if he will run for the Senate seat being vacated by retiring Democratic Sen. Herb Kohl. Kohl announced Friday he will not run for reelection in 2012, leaving Democrats to defend 23 Senate seats in the next election. Ryan, who serves as chairman of the House Budget Committee, is one of the names discussed as a possible replacement. I pray to God that this right wing teabugger nit case does not run for a higher office. We in Rock Co. Wisconsin are already embarrassed with his proposal to cut the top 5% rich income families tax rate from 35% to only 25%. Even when the actual rate they are paying is really only running 17% with all the tax breaks for the rich already have. Paul, get out of politics not into it any more! Last time I looked I was paying 27% without any tax breaks! He will win. The voters of Wisconsin are like slaves just liberated from their master (Dem party, unions, etc) and are ready to move into a future unsoiled by the likes of Kohl. Rep. Ryan, just like Sen. McConnell who spoke before him, did not answer any questions directed at him. I point this out because it was done in such an obvious manner. When asked about the debt limit, Sen. McConnell spoke about "ObamaCare", something which does not exist in my mind. When Rep. Ryan was asked a similar question, he spoke about the high cost of Medicare. The GOP is trying to paint a sincere, concerned for the people, reasonable image for themselves. Yet at the same time they come to the table declaring areas as being "off the table". The want you to believe that the Demcrats have their own set of areas that are "off the table" when in fact the Democrats have made no such claim. In truth, Democrats have expressed openness to discuss all issues, including entitlement programs. The American people have spent the past two weeks telling Republicans what they want "off the table", not Democrats. The will of the people was expressed in town halls across the country to Republicans, and they return to DC doing the exact opposite. 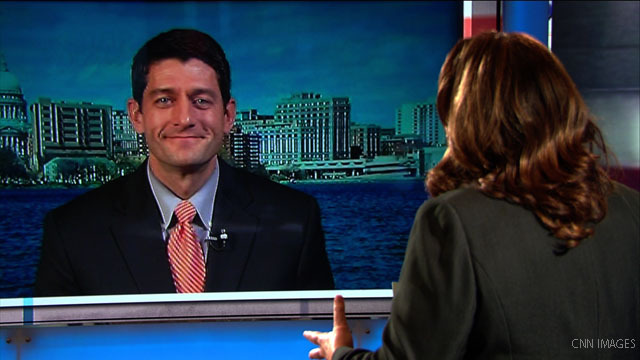 Rep. Ryan knows that he will face a most difficult time winning a statewide office in Wisconsin. Whether he runs or not will be a test of his self confidence in his policies, which are more unpopular in Wisconsin than any other state. I just hope that the people in Wisconsin finally woke up. They have enough problems without adding this idiot to the mix. If not, then, they deserve anything he does to them. And another clown tries to join the circus. You got fooled with Walker, good people of WIsconsin. Don't make the same mistake again. If anyone has wondered why we always seem to see so many Republicans on the Sunday political news shows, don't forget those shows need advertising dollars. Sponsors are willing to pay more for Republicans than Democrats. It's a business decisions, not a political one. Just look at who the major sponsors are and where they political donations go. "I don't want to 'dwindle' on this..." Uh, exactly what does that mean? I think the boy genius needs a dictionary. The guy who wants to kill Medicare (and Social Security too, by the way) in order to give bigger and better tax breaks to millionaires, billionaires, and corporations wants to be a senator? Seriously? Wisconsinites, how do you feel about this? Root and stem, so the voters of Wisconsin are ready to be taken over by the corporatists, who will work to destroy the middle class by making sure it pays for corporate welfare and handouts to those who least need them? Huh, go figure. Don't the People of Wisconsin all ready had enough with the stuff the GOV of Wisconsin did, why would you want Paul Ryan as a Senator. I don't think he would even Win his seat in Congress back In 2012. But that what we as American People need to do Is get rid as many OF Republican and Tea PARTY person out of the House and Senate as we can In 2012. We need people In there that can get the Deficit down Fair foe everybody, Even If It mean Rising Taxes. Maybe both Ryan and Bachmann will run for the Senate seat and lose. That way, the voters of Wisconsin can knock off two birds with one stone. If they recall Walker and some of their state senators, they will then be on the way back to political common sense.